This entry was posted in Environment and tagged osprey, Terrain Westport. Bookmark the permalink. SPRING HAS REALLY SPRUNG IN SPITE OF A CALL FOR SNOW TONIGHT/TOMORROW . . . Both or just one? The male usually shows up first. 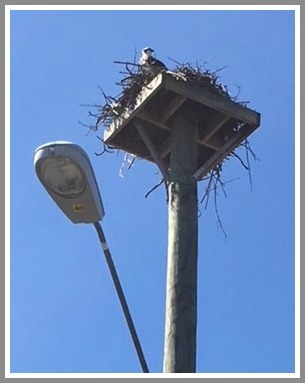 I’m monitoring a two Westport nests for Osprey Nation. Both are back on one nest, only the male on the other. Happy Spring! Thanks, Rindy — good to know! I saw one on the nest in the parking lot at the Longshore Marina a week ago. My husband and I enjoyed brunch at terrain today and really loved the view of the nest from the cafe. I only saw one. Not sure if it was the male or female. Either way, they were very hard at work renovating the nest! It was absolutely magical to see. The branches that were being used as lumber all got meticulously worked into the nest. Such Beautiful creatures. Sarah, if the angle is right you can tell them apart because the female wears a “brown necklace” while the chest of the male is plain white. Once the eggs are laid and the chicks hatch, the mother is on the nest almost all the time while the male goes fishing to feed everybody.